Now available for hire from TFS - 8 Track Location recorder. Discounts available for extended hire. 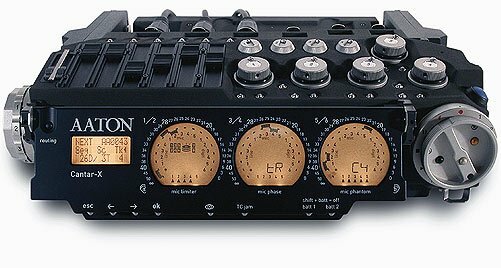 Aaton's legendary ergonomics applied to Digital Audio Recording. Our long commitment to operator comfort, equipment sturdiness, and highest possible performance gave birth to Cantar, the Stradivarius of new generation multi-track digital sound recorders. Cantar offers more than any other machine in terms of operational control: total separation between the fader panel for the hands and the display panel for the eyes. With Cantar, the recordist has permanent access to real mechanical faders, each devoted to one function only. Five mic and four line rotary analog prefaders, plus six linear digital mixer postfaders! No other machine offers such luxury (some of them have only four all-purpose knobs...). With Cantar's slanted working surface, the easily reachable faders are positioned in such a way that operator's hands rest on them in a perfectly natural position, whether Cantar is on the shoulder or the cart. 'Cantar Sound' has already become a reference among musicians: they have never seen such a small machine produce such a big sound.